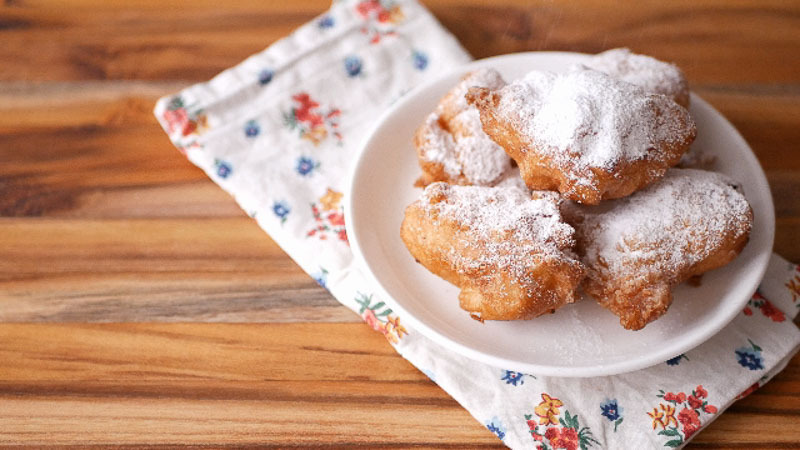 Recipe for Apple Fritters. Apple Bajji Recipe. Deep fried sweet fritters made with apples and spiced with cardamom. Step by step Video Recipe. This is an easy and quick recipe that is perfect for an after school snack and can be put together in under 15-20 minutes. Peel and core the Apple. Set aside. Any kind of firm apples will work for this recipe. I have used one big apple today. Chop the apples into small squares. Set aside. Now we will slightly cook the apples. Heat a pan and add in the ghee. Add in the chopped apples, cardamom and the sugar. Cook briefly till the apples are soft. About 2-3 minutes. Set aside. Now we will make the batter for the fritters. Mix in the eggs, sugar and the water. Whisk well to combine. Now add in the Maida (all purpose flour) and the baking powder. Add in the cooked apples. Mix well to combine. If the batter is very dry, do add a tablespoon or two of water if necessary. Heat oil in a pan to deep fry. When the oil is hot, add in scoops of the fritter batter and fry on a low-medium flame. It will take 2-3 minutes for each batch. Cook on a low-medium flame so the batter gets cooked well inside. 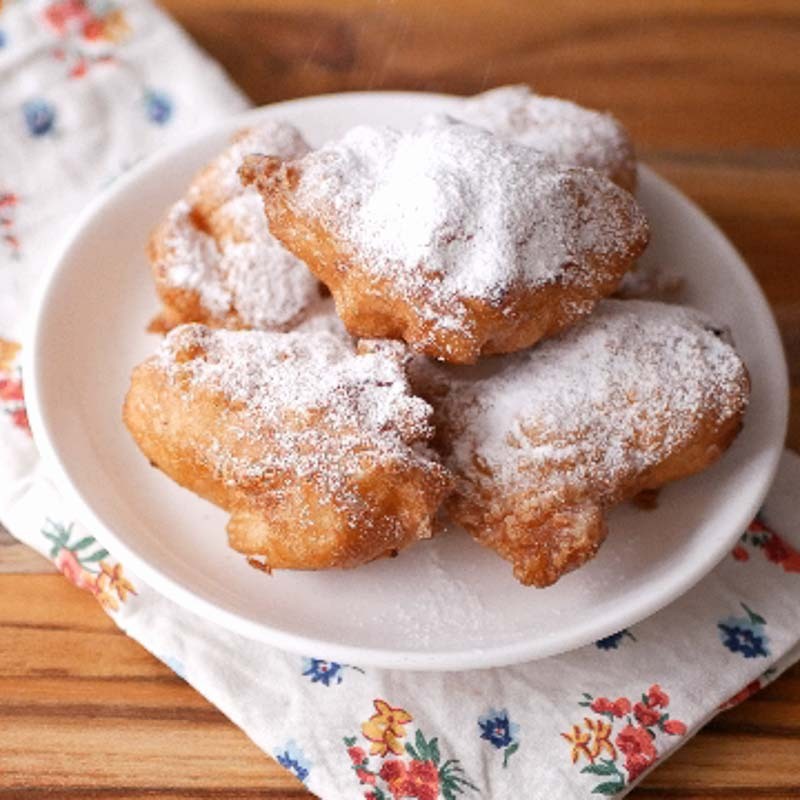 Recipe for Apple Fritters. Apple Bajji Recipe. Deep fried sweet fritters made with apples and spiced with cardamom. Peel and core the Apple. Chop the apples into small squares. Set aside. Heat a pan and add in the ghee. Add in the chopped apples, cardamom and the sugar. Cook briefly till the apples are soft. About 2-3 minutes. Set aside. Now add in the Maida (all purpose flour) and the baking powder. Add in the cooked apples. Mix well to combine. If the batter is very dry, do add a tablespoon or two of water if necessary. Heat oil in a pan to deep fry. 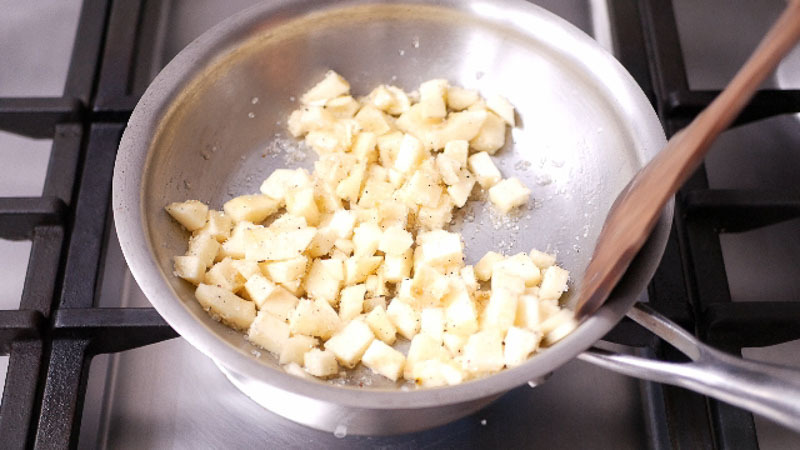 When the oil is hot, add in scoops of the fritter batter and fry on a low-medium flame. It will take 2-3 minutes for each batch. 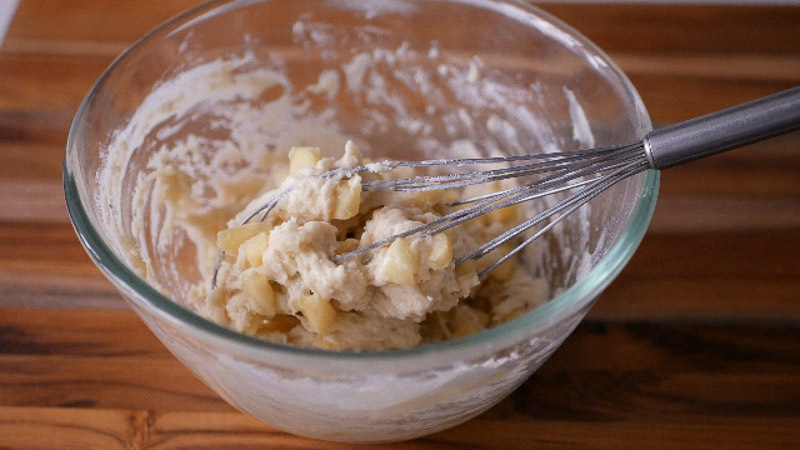 In the final picture of this apple fritters recipe, some thing white is sprinkled over. Is that sugar powder? Yes. It is powdered sugar.